Click on the class name from your home page. Click on the "Add Assignment" button on the class homepage. Select an assignment type (the default is Paper Assignment),then click Next step. Follow the boxes below from 1 to 12 to complete the remaining steps. Enter a title for this assignment. Enter a mark for this assignment in the Point value (optional, it's only used if you're going to use Grade Book). Start date: is the date and time that students can begin submitting to the assignments. Due date: is the deadline for the assignment after that date and time; no submissions are allowed unless late submissions are enabled. Avoid making deadlines on the first and third Saturdays of each month as all Turnitin services may be unavailable for use during a scheduled maintenance. Post date: is the date and time when grades become available for students to view, this option for Grade Book or GradeMark users so students will be able to see the feedback left on their papers . It could be after or before the due date but t is recommended that the post date be after the due date to give you time to grade. Check next to "Allow only file types that Turnitin check for originality" to allow only accepted files by Turnitin that can generate Originality Reports to be submitted to the assignment. If you check next to "Allow any file type", any file will be allowed to be submitted but some will generate others not. Click on "Optional settings" to complete the advanced settings of the assignment. 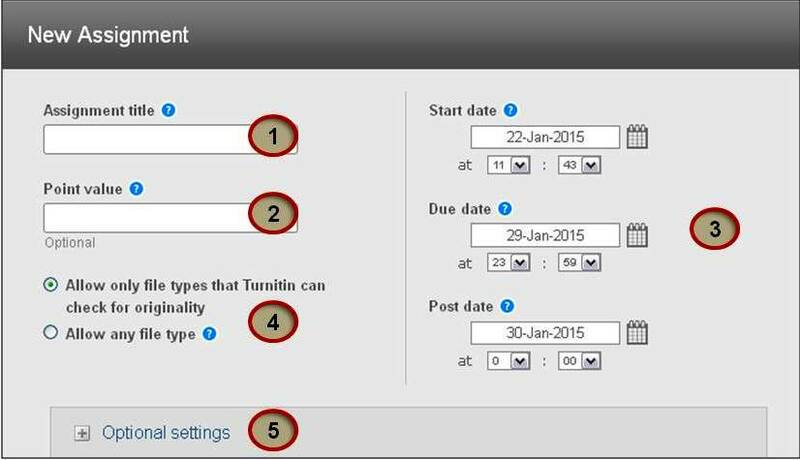 This setting allows the instructor to select whether he/she will accept late submissions to the assignment or not. If Yes, then late submissions will be highlighted with red in the assignment inbox. A student cannot overwrite a submission past the assignment due date and time, even if the late submission option is enabled. Immediately (first report is final): Originality Reports for all submissions will be generated within an hour depending on the server & file size. Students cannot resubmit papers. Submissions must be deleted by the instructor to enable resubmission. Immediately (can overwrite reports until due date): The first three resubmissions will generate a new Similarity Report; after three attempts, a 24-hour wait is taken to generate similarity reports for all subsequent resubmissions.Resubmission is allowed until the assignment's due date & time where previous versions are overwritten. Only the latest submission is available to the instructor & student. A change in the Originality Report similarity index may result from the regeneration of the reports. This option is used when students are self-reviewing and revising their submissions and able to view the Originality Report. on due date: Originality Reports will be generated on the due date and time of the assignment. Students may resubmit as many times as needed until the due date and time without receiving reports. Resubmissions will not be allowed after the due date and time of the assignment. 7. Allow students to see Originality Reports? Instructors can allow students to see Originality Reports or not. If No has been selected, then the report will show Not Available to the students. Student paper repository - works previously submitted in classes and assignments on Turnitin. 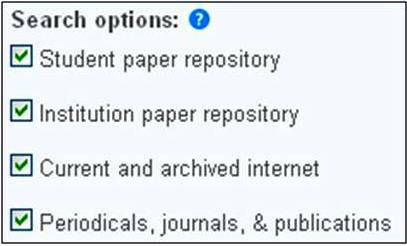 Institution paper repository - a repository of student papers for the institution. Periodicals, journals, & publications - including many major professional journals, periodicals, and business publications. Instructors can enable the e-rater grammar and spelling check for all submissions;so student can receive detailed grammar feedback in GradeMark automatically through the e-rater technology. Select the ETS handbook level from the drop-down menu to view information about the grammar errors the e-rater technology finds in their paper. The Categories enabled by default option allows instructors to choose which criteria will be applied to the submissions and feedback is enabled when viewing GradeMark report. This setting allows the instructor to write important instructions about the assignment. Instructors have the ability to exclude quoted material, bibliographies & small match from the Originality Report either when creating the assignment or after submission within each originality report. Doing so may lower the similarity index (percentage) of the Originality Report. This feature allows instructors to automatically exclude or include bibliographic material from being checked for matches in the Similarity Index when generating Similarity Reports. Bibliographic materials can also be included and excluded when viewing the Originality Report. This setting cannot be modified after the first paper has been submitted. The system will start similarity check when these key words found: references, references cited, references and notes, resources, bibliography, works cited. Exclude quoted material from Similarity Index for all papers in this assignment? This feature lets instructors to automatically exclude or include quoted text in the Similarity Index. Quoted materials can also be included and excluded when viewing the Originality Report. This setting cannot be modified after the first paper has been submitted. This feature provides instructors with the ability to automatically exclude sources in the source list that are below a set word count or a percentage score from all originality reports to focus on larger, more problematic and suspect matches. Once yes has been clicked the Exclude matches by: option window will open. Enter into either the Word Count or Percentage fields the numerical value for small matches that will be excluded from originality reports in this assignment. This option can be adjusted anytime. Students have the ability to exclude (or re-include) quoted material, references, and small matches from the Originality Report. Doing so may temporarily change the similarity index (percentage) of the Originality Report but will NOT be saved as it will return to the original percentage after the student closes the report. Only changes made by the Instructor are saved. 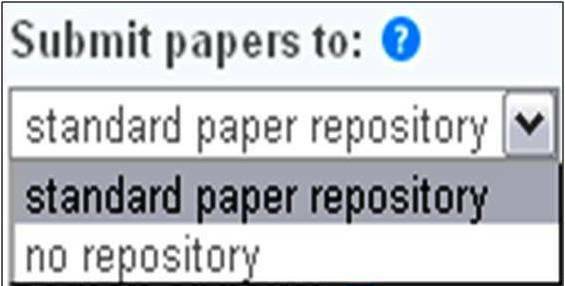 Standard paper repository : submitted papers will be part of Turnitin student database to use it for future matching between other papers submitted to the same class or other classes or other institutions' student submissions. No repository : not to save submitted papers to the Turnitin student database& accordingly won’t be available for future comparisons (this would be better in group project papers or lab reports where several students in a group would submit the same paper for the assignment. If you would like to use a rubric to grade the papers submitted to the assignment you may use the "rubric list" drop down menu to select a previously created or imported rubric or you can launch the rubric manager by clicking on the "Launch Rubric Manager" link and create a new rubric or grading form to attach to the assignment or download & import online rubrics by clicking on the "Find a rubric that's right for your assignment in Turnitin Teaching Tools" link or choose "No rubric/form". 12. 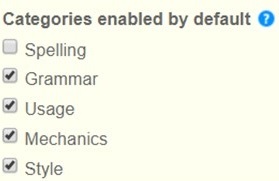 Would you like to save these options as your defaults for future assignments? To edit the settings of an assignment, choose "Edit settings." To submit on behalf of a student, choose "Submit." To delete the assignment, choose "Delete assignment." Move to the next page to enroll your students into your class.